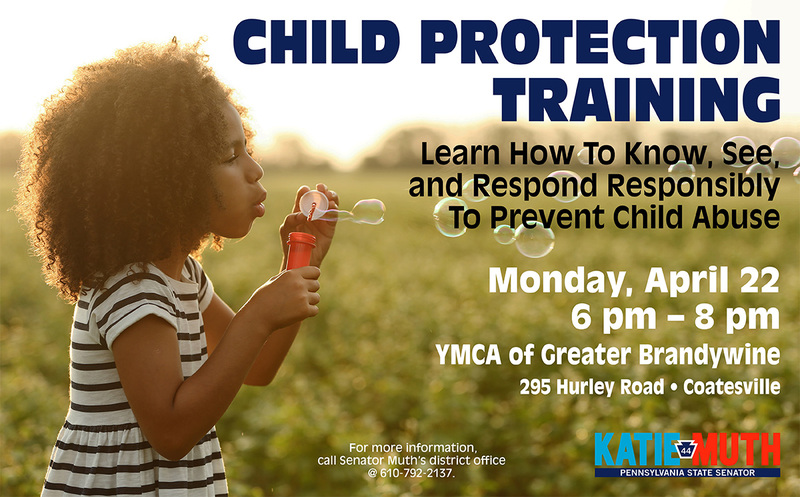 Senator Katie Muth is hosting the YMCA’s delivery of a powerful Child Protection Training entitled, “know See Respond”. This is a prevention training that teaches adults how to prevent, recognize, and react responsibly to child sexual abuse. The program is designed for all individuals concerned about the safety of children. It is an evidence-informed program proven to increase knowledge, improve attitudes, and change child protective behaviors. Please join us as we bring “Darkness to Light” and learn how to better protect children. For more information please contact Senator Muth’s district office at 610-792-2137 or email www.senatormuth.com.